Take yourself back to Madison, Wisconsin in 1951 and you'd be hearing Bobby Hodge, the "Rainbow Ranger" over WKOW every Saturday for 30 minutes. His show was definitely a hit with the sponsors for they mentioned he had no less than eight sponsors for his show. 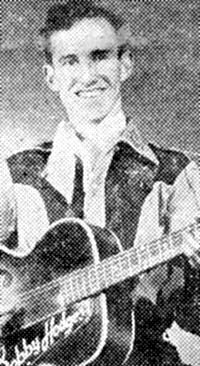 One of Bobby's influences was the legendary Hank Williams and he often featured Hank's tunes on his show. Bobby was also a part of the "Dairyland News" stage shows that were common in southern Wisconsin during that era. When he found the time, he also played guitar with Stu Wilson's Orchestra in Madison.